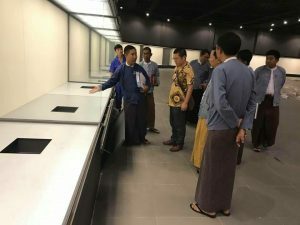 April 19,2017, the Minister of Myanmar Culture Department and the Directors of National Museum of Myanmar(Nay Pyi Taw)had an inspection on the museum display cases installation by Wangda Showcases.The National Museum of Myanmar has five wings: A,B,C,D and E. In the hall A, mini theatre, VIP holding hooms, president’s gifts exhibition room and public areas are included. Primates and Fossils Exhibition Room-This exhibition room displays fossils of Pondaung formation, petrified plants found in Pondaung formation and Irrawaddy sedimentary formation. 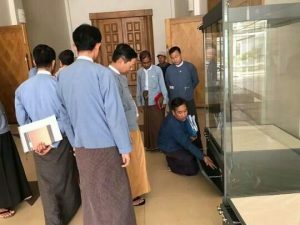 The display highlights the fact that Myanmar civilization developed uninterruptedly and Myanmar is one of the original places of homo sapiens. 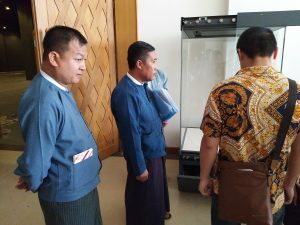 Anthropologist the world over agreed that Myanmar’s humanoid primate display at the exhibition room, is the most pre eminent anthropoid primate. Pre Historic Period Exhibition Room-In this exhibition room, tools, weapons and utensils from Myanmar Stone Age, Bronze Age and Iron Age are displayed. Miniature replicas of Padah-Lin Caves is displayed with the supporting special lighting and models. Center piece of the display is miniature replica of the excavation site of bronze age with the supporting objects such as pots, urns, beads and bronze weapons. 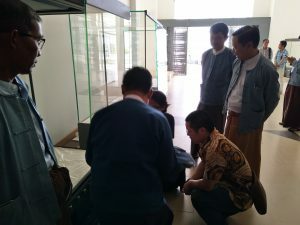 Proto Historic Period Exhibition Room-Small scale model of UNESCO’s World Heritage listed Halin, Beikthano and Sri Ksetra Pyu cities and other early Myanmar city states from all over the country are revealed in this room. Moreover, five Pyu figurines, gold, silver, bronze and earthen artifacts from excavated sites, are displayed in this exhibition room. Historic Period Exhibition Room-In this exhibition room, miniature replica of religious structures, literature, architecture, cultural artifacts and religious objects are displayed. Center piece of the display is Bagan architecture showing religious structure, wall painting, fresco, masonry and ceramic works. Myanmar Art Gallery-The display of Myanmar paintings includes old traditional paintings, wall paintings of successive eras, Jataka epic paintings and masterpiece of doyen artists. It is divided into old genre paintings, contemporary paintings, modern paintings and classic painting. 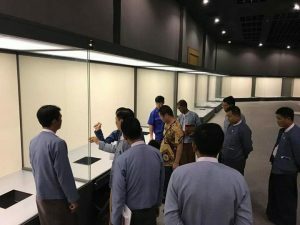 Myanmar Performing Arts Exhibition Room-This exhibition room displays Myanmar dramatic art, Myanmar traditional orchestra and miniature theater stage made in accord with tradition. Myanmar traditional musical instruments, Myanmar marionette and various musical instruments of Kachin, Kayah, Kayin, Chin, Bama, Mon, Rakhine and Shan national races are also displayed.